Join the New Adult Fiction revolution! From Sylvia Day’s Bared to You to Jamie McGuire’s Beautiful Disaster, new adult fiction has arrived—and it’s hotter than ever. But there’s more to this category than its 18-to-26-year-old characters: The success of your story depends on authentically depicting the transition of your young protagonists from teenhood to adulthood. With Writing New Adult Fiction, you’ll learn how to capture the spirit of freedom, self-discovery, and romance that defines the new adult experience. Create memorable characters that act and sound like new adults. Sculpt a distinct personality for your fiction with POV, voice, tone, and word choices. Build a unique, captivating plot that satisfies your audience from beginning to end. Learn tools for revising effectively and efficiently in a speed-driven market. Weigh the options for your path to publication: traditional, indie, and hybrid. The new adult category is filled with opportunities to break in with distinct plots and original characters. Make your mark by writing a novel that’s fresh, unique—and wholly new adult! When I began writing the story that became the global bestseller Bared to You, there was no New Adult subgenre of fiction. I had no idea my tale of a recent college graduate tackling adulthood and her first mature relationship was tapping into a particular niche. I knew only that my heroine was on her own for the first time, making new mistakes while trying to learn from her old ones. In many ways, I was embarking on a new chapter along with my heroine. 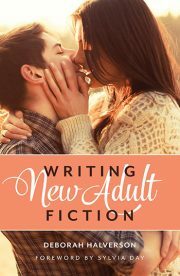 In picking up Writing New Adult Fiction, you, too, are turning to a new page in your writing career. Trying new things and taking risks is very much a part of being a successful entrepreneur, and educating yourself about the avenues you wish to explore is one of the most important aspects of career building. I commend you for performing your due diligence. By compiling the appropriate knowledge base to begin your story with confidence, you are contributing to your own success. Take what you learn in the pages that follow, then adapt the knowledge to suit your story and style. Let the information work for you. Learn the rules so you can break them. You will lead your New Adult characters on a similar journey of discovery and adaptation. It’s a path we can all relate to, which is why the genre resonates with so many readers, regardless of age and background. I have long said that we as readers fall in love with characters not for the things they get right, but for the things they get wrong. I hope you will give yourself the same latitude. You are not writing another version of an existing story. You are writing your story and that means you will be taking a road not yet traveled. You may get lost, you will certainly hit bumps in the road, you might have to turn around or take detours. Deborah’s advice and guidance will help you spot the landmarks, but forgive yourself for any misadventures. Careers aren’t built on successes; they’re built on the lessons you learn from your failures. But you won’t fail. You’ll write the next great New Adult novel, and I look forward to reading it.